A three-day workshop commenced on October 04, on the theme ‘Future Policing Prospects and Challenges for South Asia’ was held at Kingsbury Hotel, Colombo. Heads of Police in South Asian Region and their representatives who are in Police Service at present, scholars , professionals, specialists including the Chairman of The National Police Commission Prof. Siri Hettige, Inspector General of Police Pujith Jayasundara and Prof. Imthiyas Ahamed participated in this event. 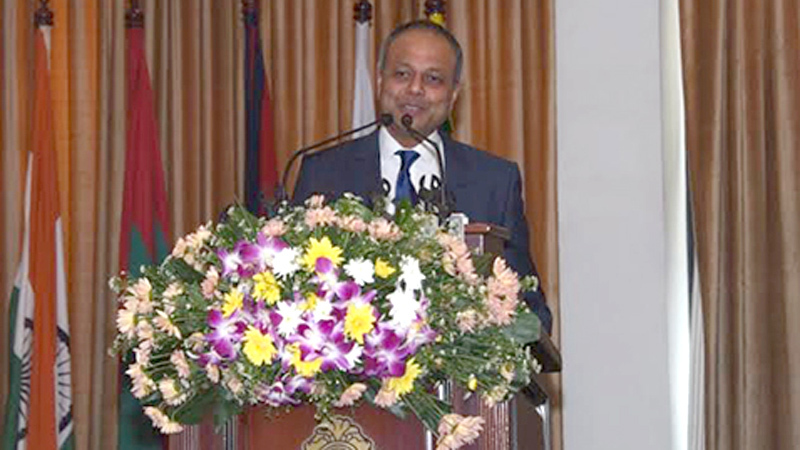 Issuing the valedictory speech on the third day of the conference Law and Order and Southern Development Minister Sagala Ratnayaka said at this crucial stage of Sri Lanka’s contemporary history, he is particularly proud to be able to provide leadership to a Department that has a maturity of 150 years, with a majority of its officers comprising Sri Lanka’s finest. "Ladies and Gentlemen, American sociologist, Egon Bittner observed in 1974, that the police service was one of the ‘best known but least understood’ public institution. At a time when we are celebrating 150 years of that institution in Sri Lanka, I will be remiss in my duty if I do not delve into the very basis and the nature of policing. The Latin word “polis” refers to the “state”. The Greek “politeia” meant “all matters affecting the survival and well-being of the state”. I am compelled to refer to these meanings, because the ubiquitous nature of the scope and breadth of policing in our societies today still makes these ancient definitions very relevant. Indeed no other institution interacts with the public as much as the Police. The public expects and perceives the Police in its multiple roles of; law enforcer, prosecutor, peacekeeper, guardian, community leader, service provider, guide and friend. At the end of the day, all our efforts, including the deliberations at this Conference, must finally lead to enabling the police to play these roles better, with integrity, common sense and sound judgement. We should never lose sight of the fact that the ultimate arbiter and the beneficiary of the effectiveness and efficiency of the police will and should be the public. It points out that we need to think of policing as a social phenomena essential to the life of the community and not constraint ourselves thinking of it merely as another service provided by the Government. In this context, I would like to say with certainty that Sri Lanka appreciates and understands the challenges that we, in the south Asian grouping of States, face. Most of the challenges are common. This enables us to work closely with each other; if we so choose to. Plurality of our societies; poverty and income inequality; ethnic and religious diversity; political activities that needs maturing and law enforcement and a justice system rooted in the colonial past; are some obvious and common characteristics. The challenges that these dynamics spew out require sophisticated and unique responses. Policing is no exception. That is the reason that deliberations of this nature becomes more relevant and important in moving forward to forge a common future that we all desire; of providing safety and security to our people and an enabling environment for sustainable development within a rule of law framework. More than ever before we need to have a police force that is not only physically fit and resource rich but also intellectually prepared and rich in attitude to face the dynamically changing challenges of the world. I congratulate the organisers of this event for the choice of the seven themes around which this conference had been organised. These themes clearly demonstrate the holistic manner in which we have to consider policing. I see each of these themes as bridges to cross policing from its current paradigm to another; where police will transform itself from being seen as a mere enforcer to that of a key partner and stakeholder in our quest to evolve our societies through economic development; better protection of human rights and better governance and enhanced democracy. Police will also have to harness positively the potentials of information technology; protect, preserve and enhance our environment; secure and consolidate our societies during natural and man-made disasters; remove glass ceilings that prevent women from reaching their full potential; protect our children and the vulnerable; and manage religious and ethnic conflicts from reaching violent proportions. This is an enormous task to achieve. Police will need different enabling laws, new institutional mechanisms, new tactical and strategic processes, updated rules of engagement, resources and training. Most of all, both the Police and us, the policy makers, will need a paradigm shift to see the role of police and the function of policing differently. No longer can we have the luxury of policing in an isolated manner from the comforts of our officers and barracks. We have to actively solicit engagement of society, consider and incorporate their needs, opinions and suggestions and ensure that police processes reflect and keep up with the developments taking place elsewhere. Six years after concluding the war against one of the most ruthless terrorist organisations in the world, Sri Lanka has commenced a new chapter in our policing. The reestablishment of a strengthened and independent National Police Commission with a constitutional mandate and comprising of eminent personalities representing diverse areas is considered as a crucial first step in modernising the policing function. Similar to most countries of South Asia, we too face the urgent need to enhance the capacity of our police department particularly in crime prevention and forensics. I just returned from New Zealand, where I had the opportunity to visit a Police District Command Center, where data is analysed real time to meet their primary objective; crime prevention. We are fully conscious of the critical role that the police will play in the national reconciliation effort through diversity and conflict sensitivity. I am proud to say that the Police Personnel have always demonstrated a commendable enthusiasm to take on that responsibility. As a government we continue to forge strong international linkages especially with our immediate neighbours in South Asia. Economic cooperation is key if we are to benefit from harnessing regional potential in a globalised world. On the flip side these also will open our borders to transnational crimes, necessitating national law enforcement to cooperate meaningfully with regional and international law enforcement. As a regional block we will be faced with transnational threats such as environmental issues, international trade that ignores movement of capital and persons across the borders but creates global communication networks that penetrate borders electronically and threaten national languages, customs, and cultures. I may emphasise particularly food and water security; and violent conflicts that cross legal and geographic boundaries along ethnic and religious lines. Ladies and Gentlemen, this conference is a commendable initial step in recognising the global context. It is my fervent hope that what you conferred today will have utility value going forward and that the understanding that you gained will forge new strategic relationships at an operational level. I congratulate the National Police Commission and the Inspector General of Police for this initiative. On behalf of the Government of Sri Lanka I once again warmly welcome you to our shores and thank you for your contributions at this conference. We are glad that you joined us when we acknowledge and celebrate a significant milestone of our police service. I hope you will carry back with you pleasant memories and the assurance of my Government’s continuous commitment to regional cooperation for enhanced security through rule of law."